Published by: Pegasus Books Ltd. The ghost story has long been a staple of world literature, but many of the genre’s greatest tales have been forgotten, overshadowed in many cases by their authors’ bestselling work in other genres. 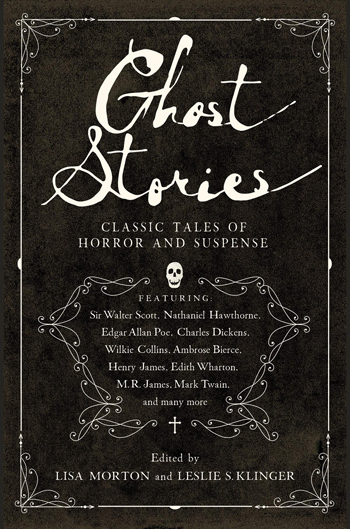 In this anthology, little known stories from authors like Charles Dickens and Edith Wharton are collected alongside overlooked works from masters of horror fiction like Edgar Allan Poe, M.R. James, Arthur Machen, Ambrose Bierce, and Wilkie Collins. SWEET WILLIAM’S GHOST is a classic ballad about a ghost visiting his love who is still alive. I read this out loud to myself and it really had more of an impact then when I just read it in my head, it’s definitely a great story. THE FAMILY PORTRAITS by Johann August Apel is a story about a man traveling to check out his marriage prospects, when he is invited to join a group of women telling ghost stories. He hears the story of Juliana, a girl who is terrified by a family portrait. This is a story that gives you a very uneasy feel but you can’t put it down, this is one of my favorites in the collection. LIGEIA by Edgar Allan Poe his story follows an unnamed man and his wife Ligeia, she ends up ill and dies. The man remarries but his second wife ends ill and dies also, guys pretty unlikely. He decides to stay with his wife’s body, that’s when things get strange. I’ve always liked Poe but this is the first time I’ve read this story. I really liked this one, it’s right up there as one of my favorite stories in the collection. THE SUBSTITUTE by Georgia Wood Pangborn is about a woman getting a surprise visit from an old friend, a story that proves a mother’s love is endless. It was very well written and had great descriptions. There are many more great stories in this anthology, if I were to write about each this would be a very long review. I really enjoyed every story and think it is a must read for anyone who likes ghost stories.